In this inaugural issue, we want to emphasise the existence of the non-conformists, the eccentrics and the originals. Their ideas and critical views. No matter what field they may come from. Mayday 1: ‘We live in unpredictable times. Times of incredible technological advancement and multi-speed development. Of polarisation and immense socioeconomic shifts. It’s a time of big surprises. We know nothing. But if we know how to thrive and exist in that uncertainty, we know something. That’s why the future belongs to creativity, free will and strong character. And trust. This is how we embrace the obscure. 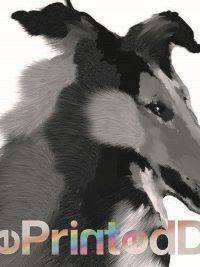 In this inaugural issue, we want to emphasise the existence of the non-conformists, the eccentrics and the originals. Their ideas and critical views. No matter what field they may come from. 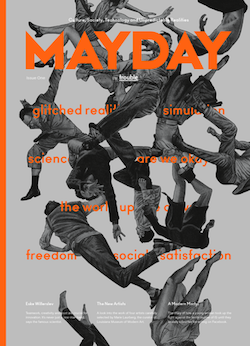 We believe in critical and independent thinking as much as we prefer character over popularity, and so, Mayday is a magazine full of heroes and villains and extreme ideas. Here you go. The world is becoming faster and more radicalised than ever. 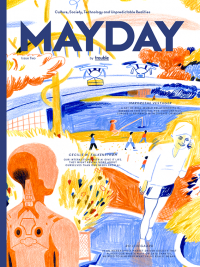 Mayday is an independent magazine about the erratic realities facing people, society, business and culture. Mayday is for women and men who are curious about the future. We cover art as much as technology, hope as much as despair, and creativity as much as destruction. 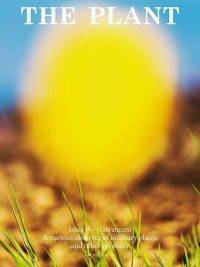 As long as we see fascinating ideas or troublesome thinking. We are curiously exploring corners of the world and the mind on how to exist when you can’t predict the future or even the next day.